Thousands of Share the Gulf supporters—from chefs and fishermen to conservationists and consumers—have weighed in to oppose H.R. 200 and S. 1520 in their current forms. Other industry leaders around the country are speaking out against these harmful bills, including Alabama fisherman David Walker who wrote a powerful piece in The Hill. He explains how proposals like S. 1520 undermine the health and productivity of fisheries in the Gulf and around the country. More than 30 fishing organizations from across the country have written to Congress expressing concerns about S. 1520. They joined a group of more than 175 chefs, restaurant owners, and seafood dealers, including signatories from all five Gulf States, who sent a letter to Congress opposing these bills. Dozens of prominent New Orleans chefs sent a letter to Congress encouraging legislators to protect the strong science-based conservation standards of our top fisheries law. The leading organization representing commercial red snapper fishermen, the Gulf of Mexico Reef Fish Shareholders’ Alliance, sent a letter expressing their concerns. Additionally, Gulf and South Atlantic commercial fishing affiliates of national fishing organizations currently oppose the bill, raising their own concerns over other problematic provisions of H.R. 200 that would impact the region. Join the thousands of Share the Gulf supporters in opposing these bills. Tell your Member of Congress to keep our Gulf fisheries strong and healthy. Learn more about the bills here. The Gulf of Mexico’s fishing and seafood tradition has especially deep roots in Mississippi. In fact, Biloxi was known as the “Seafood Capital of the World” at the beginning of the 20th century. Now, Mississippi Commercial Fisheries United (MSCFU) and its Executive Director, Ryan Bradley, have a plan to honor the state’s fishing heritage and strengthen its industry, with a timely focus on sustainability. MSCFU is now joining the Share the Gulf Coalition, which includes more than a dozen organizations and hundreds of chefs, restaurant owners, seafood industry representatives, and fishermen. Ryan, Bradley, Executive Director of the MSCFU speaking at the event in Gulfport, MS on April 18, 2018. With its focus on promoting stewardship in the commercial fishing industry and fair access to Gulf seafood, MSCFU is an important addition to the Share the Gulf coalition as Mississippi’s commercial fishing sector can be underrepresented in discussions about fisheries laws. In that vein, Share the Gulf, MSCFU, the Gulf of Mexico Reef Fish Shareholders’ Alliance and the Charter Fisherman’s Association co-hosted a reception at Salute Italian & Seafood Restaurant in Gulfport, MS on April 18, 2018. Attended by Mississippi Congressional legislative staff, members of the Gulf of Mexico Fisheries Management Council and high-level representatives of the National Marine Fisheries Service, the event gave the coalition a chance to formally welcome MSCFU to its ranks and spread the message that fair and sustainable access to the Gulf’s fishery resources is a Mississippi tradition. You can learn more about MSCFU by clicking here. Earlier this week, despite opposition from fishermen, chefs, conservationists, and consumers, the Senate Commerce Committee advanced S. 1520, a bill that threatens progress made in the Gulf to sustainably manage fisheries and the ability to provide fresh, local seafood to Gulf communities. While we are disappointed, we are encouraged by the opposition recorded by a number of Senators and a commitment by Senator Bill Nelson of Florida to address remaining concerns with the bill before it advances. The bill’s proponents claim it will increase fishing opportunities for recreational fishermen, which we all agree is a worthy goal. But the reality is it offers no real change and instead includes provisions that would hurt conservation and our seafood industry. We joined Share the Gulf because we believe we can solve problems without harming our seafood heritage or the long-term health of our Gulf resources. The bill would take away important conservation tools, while gridlocking our regional Fishery Management Council with contentious fights over fish allocations that challenge public access to seafood and don’t really solve any problems. S. 1520 stifles innovation for solving overfishing by placing a two-year moratorium on new catch share programs in the Gulf as well as the Mid- and South Atlantic , even though catch shares have completely stopped overfishing in the commercial fishing sector. The bill also creates additional burdens for scientific research pilot programs known as Exempted Fishing Permits (EFPs), which have long been a way for fishermen and researchers to form collaborations and pioneer solutions to some of the most difficult fisheries challenges. Seafood and fishing are core to our economy, heritage, and way of life. These harmful provisions should be removed before any further consideration of S. 1520. We appreciate your continued support of the Share the Gulf Coalition and will keep you updated on this bill and other pending fisheries legislation in Congress. Captain David Walker is a commercial fisherman from Andalusia, Alabama and Stephen Stryjewski is chef and owner at Cochon in New Orleans, Louisiana. February 8, 2018 – In an effort to keep our supporters informed about the threats and opportunities facing the Gulf, we are starting a regular news roundup like the one below. Last week, the Gulf of Mexico Fishery Management Council recommended the approval of five Gulf state proposals to test state management of recreational fishing for red snapper. While there are a lot of critical details to hammer out before the projects hit the water, this could be an encouraging step in the effort to fix the currently broken recreational management process. While the states may be best equipped to manage private recreational anglers, it is clear that the vast majority of federal charter boat captains and commercial fishermen want to stay under federal management and should be excluded from this experiment. If approved, the proposals (submitted to NOAA as exempted fishing permits, or EFPs for short) would allow each Gulf state to set the start and end dates for recreational harvest of red snapper in Gulf state and federal waters. Several of the states would also test new data collection systems for tracking harvest. The Council’s approval was contingent on the condition that the decision to include federal charter and for-hire vessels by some states (Texas, Mississippi, and Louisiana) not result in a reduced federal charter for-hire season. Two bills pending in Congress (H.R. 200 and S. 1520) could stifle innovative fishery solutions by adding restrictions and hurdles to the exempted fishing permit (EFP) process. The ability to test new approaches at the regional level is allowed under the Magnuson-Steven’s Act (MSA) through the use of EFPs. These permits allow for scientists and fishermen to conduct research, test new technology, or pilot innovative management approaches. If those bills pass as they are, regional fishery councils and NMFS might not be able to pilot experimental solutions like those mentioned above by the Gulf states in the future. Take a moment to tell Congress to keep the MSA strong and continue to allow for innovation through the current EFP process. Dozens of prominent New Orleans chefs recently sent a letter to Congress encouraging legislators to protect the strong science-based conservation standards of our top fisheries law. The MSA does more than just create opportunities for innovation—its tenets have enabled the U.S. to boast one of the best regulatory systems in the world. In fact, the MSA has successfully rebuilt over 40 species, several of which are essential to the commercial fishing, restaurant, and tourism industries. 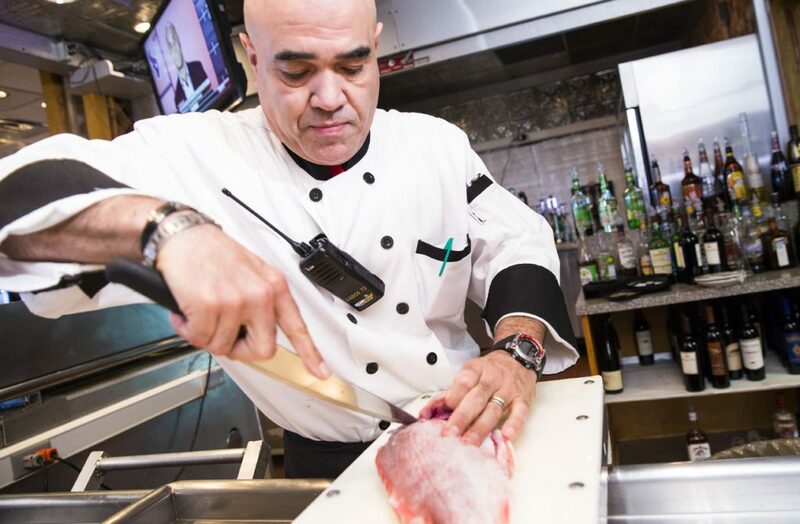 Prominent chef, restaurant owner, and Share the Gulf member Ryan Prewitt recently expressed his support for fair access for seafood-lovers—access that doesn’t jeopardize the hard-fought recovery of red snapper made possible by a strong MSA. Preliminary numbers from the recent Gulf council meeting illustrate the importance of strong conservation measures and accountability. In 2017, a decision to extend the private angler red snapper season in contradiction to MSA’s requirements resulted in private recreational angler landings exceeding the science-based fishing target by 212% and the annual catch limit by 170%. Ensuring that private anglers stay within science-based catch limits is core to the MSA and will be essential to any state management program. Thank you for your support of healthy and strong Gulf fisheries. If you would like more information or to get involved, please email the coalition directly or join the coalition here. Last week, a congressional committee voted to advance two bills, H.R. 200 and H.R. 3588, that seriously threaten sustainable fishing and the hard-fought recovery of the red snapper fishery, putting businesses, anglers, and families who depend on Gulf fisheries at risk. As you know, the hard work of fishermen and conservationists, enabled by our current fisheries law, the Magnuson-Stevens Act, has increased the amount of red snapper on the menu, on fishermen’s lines, and in the water. Provisions in H.R. 200 would weaken that law by exempting key fisheries from science-based catch limits, undermining the recovery of depleted fisheries, putting important management tools off limits for managers, and stifling the ability of fishermen and researchers to innovate. Another bill, H.R. 3588, would give Gulf of Mexico states the authority to manage private angler fishing for red snapper but would exempt them from the annual catch limit process that has helped this red snapper population grow and reproduce. While we need to fix the broken recreational management system and provide fair and flexible access for anglers, H.R. 3588 lacks adequate conservation safeguards to ensure that private anglers don’t far exceed their quota, which has occurred in the 23 of the last 27 years. The Gulf States should have a chance to succeed while working within a scientifically-justified, conservation-based backstop to protect against potential unforeseen problems. Fisheries bills have historically had strong bipartisan support. Both previous reauthorizations of the Magnuson-Stevens Act were overwhelmingly bipartisan. But H.R. 200 and H.R. 3588 lack broad support from stakeholders, and as a result, the votes last week were largely along party lines. Hundreds of Share the Gulf supporters—from chefs and fishermen to conservationists and consumers—have weighed in to oppose these bills in their current forms. Organized in part by Share the Gulf, a group of more than 175 chefs, restaurant owners, and seafood dealers, including signatories from all five Gulf States, sent a letter to Congress opposing these bills. 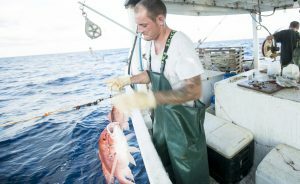 Furthermore, the leading organization representing commercial red snapper fishermen, the Gulf of Mexico Reef Fish Shareholders’ Alliance, sent a letter expressing their concerns. The fight is not over. We must continue to remind our Members of Congress that these bills lack meaningful bipartisan support and are currently opposed by fishing groups, chefs, restaurateurs, and others throughout the nation who value and depend on sustainable fishing for today and future generations. There is still time before the next key vote to tell your Member of Congress to keep our Gulf fisheries strong and healthy. Thank you for your continued support and commitment to sustainable Gulf fisheries. Share the Gulf is a coalition of chefs, restaurateurs, seafood wholesalers and distributors, fishermen, conservationists and consumers. With supporters across the Gulf of Mexico, our mission is to ensure businesses, anglers and families have access to abundant and sustainable Gulf fisheries now and for years to come. As a diverse group of stakeholders in the region, we are contacting you to express our opposition to H.R. 200 and H.R. 3588 as currently written and ask members to stand up for sustainable seafood and equitable use of federal fisheries for all of us. On Wednesday, the Natural Resources Committee will markup H.R. 200 and H.R. 3588, which in their current forms would hurt seafood and fishing businesses and the long-term conservation of our fisheries, including Gulf of Mexico red snapper. Some of us have proposed amendment language that would include conservation language and allow science-based data to direct fisheries management. Unfortunately, this hasn’t been included in the legislation’s current form. Ensure the long-term sustainability of our fisheries, including red snapper, by requiring science-based management that adheres to annual catch limits as prescribed in current law. Allow stakeholders and regional decision makers to have access to a full range of tools, including catch shares. Eliminate the mandate for burdensome periodic reviews of fishing quota allocations. Ensure that no unnecessary hurdles are introduced for fishermen and researchers to use exempted fishing permits, an important way to test management innovations and technology. Set reasonable deadlines for rebuilding fish populations so that they don’t remain depleted for decades. It has taken years of hard work and sacrifice to revitalize Gulf fisheries that anglers, commercial fishermen, restaurateurs, chefs and seafood lovers all depend on. The future of our region depends on healthy and sustainable Gulf fisheries. We appreciate you taking our concerns into account.